Beamish i s a wonderful, open-air museum in the North of England. Wonderful because it covers 300 acres of land. It is possible to hop on a tram to take you round to the different places, but we often prefer to walk around – a fantastic day out. There is a whole, early 1900s, mining village and colliery, for example; complete with school, shops, church and Davy’s Fish and Chip shop – which serves beef dripping fried fish and chips from coal heated fryers. Served in paper cones and eaten with your fingers. Delicious. And well, worth the queue! There’s another section that has a complete farm. It’s very easy to get swept up in this historical museum. And very easy to spend a day at the fairground, or visiting the country mansion. Heavy snowfall across the country kind of put a stop to my joining in with the Sketchcrawl North group meeting up in cafes around Sheffield. 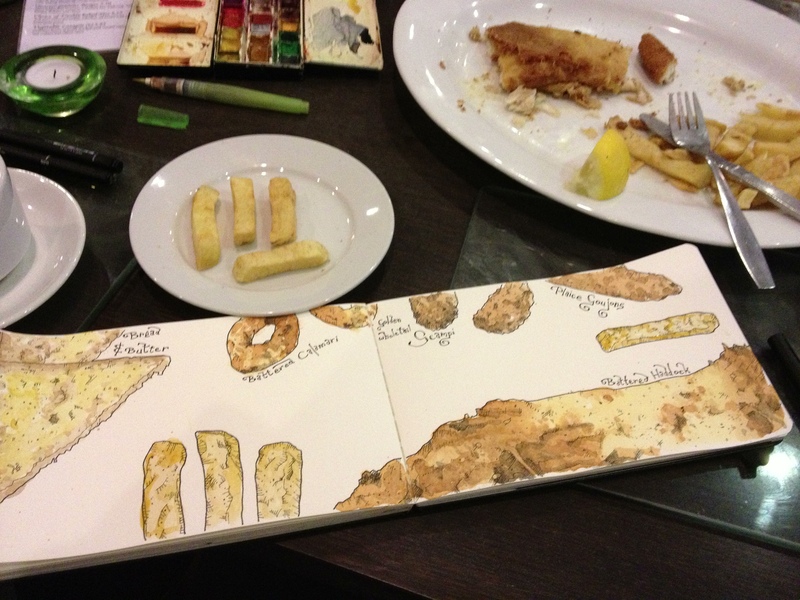 I’d been really looking forward to a whistle-stop tour of Sheffield cafes and getting in loads of foodie drawings in. Ah, well! I carried on with a bit of work at home instead. But I’d forgotten that Lucy and Caroline were popping out in the afternoon. I tagged along, and while they were busy I headed for The Golden Hind Fish and Chip shop. This is where we tend to get our fish and chips on Fridays, for our tea. And I discovered that half-past two on a Saturday afternoon, after a snowfall, is not a particularly popular time to eat at the Fish and Chip Restaurant. The place was deserted! 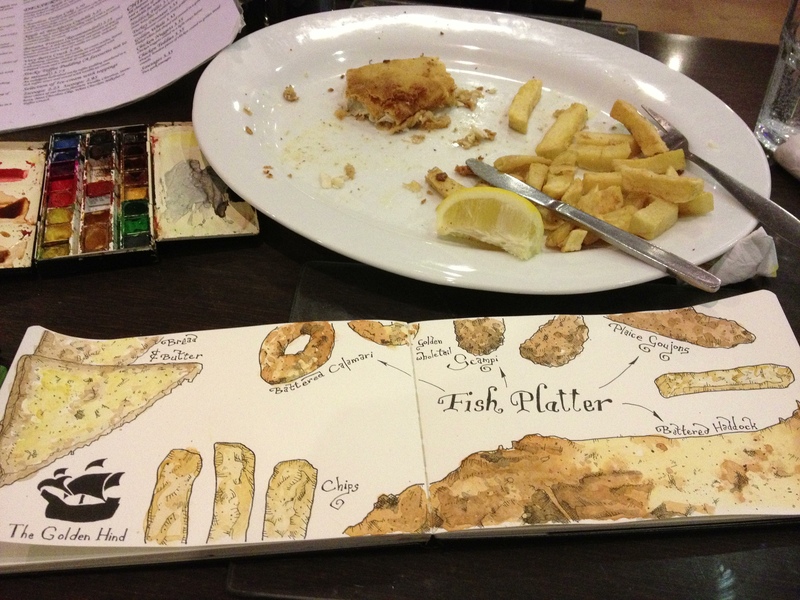 Once I’d drawn the bread and butter I started to chow down on that whilst I figured out how I was going to tackle this huge pile of fishyness. I sketched in the fish along the bottom; to frame the drawing and to leave a space in the middle of the page for writing. I thought I could draw the other elements of the meal dropping down from the upper frame. So, I started colouring in with watercolour – I used a light base colour and added in the darker areas of the batter straight away. While that dried I coloured in the Calamari Rings, as they were in a similar coloured batter. I knew I wanted to put the restaurant’s name and logo in the bottom left-hand corner by now. I finished off the rest of the writing later.